A special meeting of the Ripon City Council was called to resolve the conflicting opinions on the financial difficulties of extending the Electricity Supply to surrounding villages. It was decided to apply for a loan to supply power to Sawley, Grantley, Galphay, Winksley, Kirkby Malzeard, Azerley, Wath, Melmerby, Skelton on Ure and GREWELTHORPE. 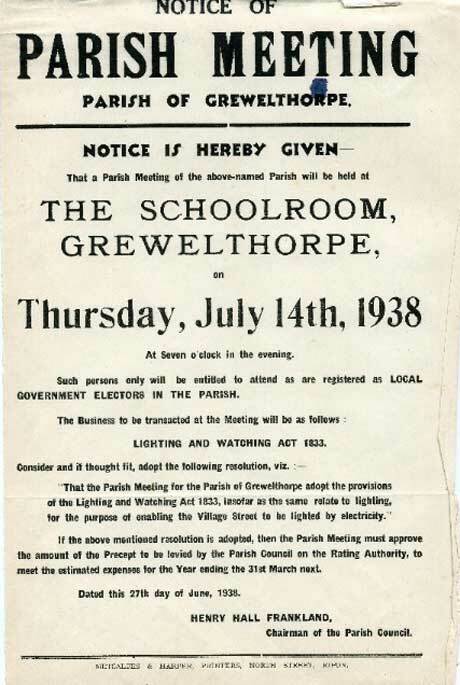 The first mention of street lights in the Grewelthorpe Parish Council minutes is in October 1937. A letter had been received from the Parochial Church Council [PCC] asking that facilities for street lighting be provided in the village. It was pointed out that since the grass verges had been laid it was dangerous coming out of church in the dark. The Parish Council agreed to take further steps if the cost of the initial installation could be provided. A public Parish Meeting was held in the village school on Thursday July 14th 1938. The aim of the meeting was to adopt the lighting as part of the Lighting &, Watching Act 1833. Present were the Parish Council and 27 local electors. The meeting was told that the cost of installation, the provision of 8 lamps together with the necessary cabling, time switches etc. would be £52 – 10s – 0d. or 5 lamps could be supplied for £44 – 10s – 0d. For either of these installations the Parish Council would bear the cost or they could pay a fixed annual charge to Harrogate Council over a number of years. This would be in addition to the standard annual charge for lighting. A vote was taken and it was agreed [17 in favour and 7 against] that 8 lamps be installed and that a precept of £22 per year be levied. The Parish Council agreed to pay for the installation the sum of £52-10s-0d in 20 half yearly instalments of £2-12s-6d on 31st December and 31st March each year. Also the sum of £2 per lamp in two equal instalments for each lighting period per year. The agreement was signed by Henry Hall Frankland and Benjamin Richmond members of Parish Council in the presence of John Edward Thorpe the village miller. And also William Leonard Trenholme village butcher and farmer. It was also signed by the Mayor of Harrogate and the Town Clerk. Of course not long after the lights were installed in the village this Country was at war with Germany. This brought the blackout regulations and the countryside was once again plunged into darkness. In 1940 it was agreed with Harrogate Council that only the installation instalments should be paid by the Parish Council and this was reduced to £5 per quarter. In 1942 on the recommendation of the Ministry of Home Security the bulbs had to be removed from the lamps. Harrogate corporation were asked to do this. The Parish Clerk was asked to look after the bulbs and he made sure that he would only store them at the Parish Councils risk. In 1944 The Borough Electrical Engineer gave details to the Parish Council of the cost of lamps at different wattages. The Parish applied for 25W lamps at 20/- [£1] each. A special lighting account was opened so that cheques could be drawn on it to pay for the lighting. In November 1945 £6-12s-6d was drawn. It would seem that 25W lights were not bright enough because in October 1946 the clerk was asked to find the cost of 60W bulbs and also whether the lights could stay on until 10-30p.m. instead of 10p.m. But in March 1947 the village was told that the lights had to go off at 10p.m. and they were still using 25W bulbs. In 1947 the Parish Council received a complaint from a resident that there was no light at Cross Hills Top making it difficult to board and leave the bus in safety. The clerk wrote to the bus company but no new light was forthcoming, in fact the village was told that under the present regulations only 50% consumption of electricity would be allowed. It has to be remembered that shortages and rationing continued for years after the war had ended. The clerk asked if shorter hours would suffice, say from 7p.m. to 10p.m. No reply on record. In November 1948 the Parish Council were complaining bitterly to Harrogate Corporation because there had been no lights for some time. They asked for a months deduction of the lighting account, and that the lights should be switched on immediately. In February 1950 a new housing estate at Holmefield was built and it was agreed to install one light in the centre of the estate. In September 1950 a new agreement was signed with the North Eastern Electricity Board. 75W bulbs were now in use and they were lit from dusk to midnight for 8 months of the year, i.e. 1st September to 30th April. They were controlled by a solar time switch. In 1956 Ripon &, Pateley Bridge Council asked the Parish Council to take over the insurance of the one light still illuminating the Holmefield Estate. They agreed to insure the lamp standard only at a premium of 6/5d [about 32p] per annum. In 1962 the Rural District Council said that in future they would be responsible for all the lighting in the village and the following year the Parish Council asked for two extra lights and for the whole system to be reviewed. In 1970 the lighting times were agreed at 6a.m. to sunrise and from sunset to midnight. In 1979 Harrogate Technical services proposed conversion to a more modern type of light, and a map and survey were produced. Cards were available for the public to report lighting faults. Three extra lights were requested. In 1983 it was reported that the quality of the lighting was now quite good. Requests were made for lights outside Squirrel House, Cliff House and at the Cross Hills junction. It was also felt that another light was needed near the pond. In 1984 it was suggested that the lights on the Holmefield estate should be brought up to the same standard as the rest of the village. In 1990 new lights were installed near Hackfall House, Prospect House and Spring House. In 1995 a light was placed outside Danesmead. In 2006 Grewelthorpe village is well lit and reports of faults are dealt with reasonable promptly. Any resident can contact Harrogate Borough Council Street lighting department or they can contact the Parish Clerk.